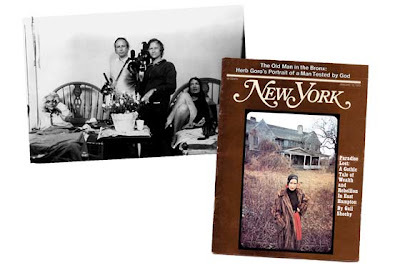 A few days ago I watched Grey Gardens by brothers David and Albert Maysles (the 1975 documentary, not the recent HBO film). What an astonishing, breathtaking film. There is not a scriptwriter alive that could have written a screenplay like that. You really must see this film. We got it on Netflix. Okay, so this is a cult classic. But I didn't see it until now. So I'm behind! I wanted to watch the documentary before I see the new HBO film, Grey Gardens, which stars Jessica Lange and Drew Barrymore as Mother Edie ("Big Edie") and her daughter, Edie Bouvier Beale, who were aunt and cousin respectively to Jacqueline Kennedy Onassis. While these two actresses are brilliant casting (I haven't seen the film yet), I am a little hesitant now to watch the movie after seeing the brilliant original documentary. How can anyone play these ladies, Big and Little Edie, better than themselves? [Added 7/12/09]: I also should mention the Broadway musical, Grey Gardens, which won a Tony Award for Best Costume Design, and its two stars Christine Ebersole and Mary Louise Wilson each won Tony Awards for their performances. The Broadway production closed on July 29, 2007. It was the first musical on Broadway ever to be adapted from a documentary. 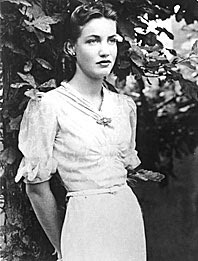 (wikipedia: http://en.wikipedia.org/wiki/Grey_Gardens). While I didn't see this show I do have the cast recording and it is excellent. I particularly noticed the attention to the unique dialect of both Big and Little Edie which I thought translated quite well into a musical format. Anyway this really is just a brilliant film in every way. It sort of transcends all genres of film: while it is a documentary it oftentimes seems like a play. Here's the general story: two aging women, Big Edie and daughter, Edie, live in a rundown estate in East Hampton....really it is a state of complete, but elegant, dishabille and squalor. The two women are very eccentric. Very intelligent. Crazy really but in a wonderful way. The movie is a series of interviews and conversations with the two which at the same time highlights the completely rundown house. Edie sings, they both sing, they tell stories, they fight (a lot). It is one of the most fulfilling and captivating movies I have ever seen. Little Edie constantly has her head covered throughout the film. She wears the most insane concoctions of clothing, brooches, scarves, shirts on her head, but they are absolutely gorgeous and chic, albeit bizarre, ensembles. According to Sheehy in her 2006 NewYork magazine article, Little Edie was bald because: "....cousin John told me about a summer afternoon when he watched Little Edie climb a catalpa tree outside Grey Gardens. She took out a lighter. He begged her not to do it. She set her hair ablaze. And in that act of self-immolation, she sealed her fate as a prisoner of the love of her mother." Here's a short clip (2min 46secs) from the film which I think captures the eccentricity. This segment features Little Edie Beale discussing "conformity" and East Hampton and the ultimate title of the original David and Albert Maysles documentary. "Passed over by history, the ladies of Grey Gardens were left to the wreck of their lives until, sweet revenge! In the sixties, they were suddenly being indulged by a nervous White House. Secret Service cars were posted outside. As Davis recalls in his book, the Kennedy inauguration gave Little Edie a chance for her own theatrics. She reminded Joe Kennedy Sr. that she was once almost engaged to his firstborn son. And if Joe’s plane hadn’t gone down while he was bombing Nazis, 'she probably would have married him, and he would have become President instead of Jack and she would have become First Lady instead of Jackie!'"